NASA released topographic data for Africa this week with the goal of helping local authorities better plan for drought, flooding, landslides and coastal storm surges, among other environmental changes. The White House is looking to data from NASA's space shuttle program to help in the fight against climate change. At the United Nations Climate Summit in New York this week, U.S. President Barack Obama announced a suite of new initiatives to help people around the world prepare for drought, flooding, coastal storm surges and other severe effects of a changing environment. Previously, the high-resolution images collected by the Shuttle Radar Topography Mission, or SRTM, which flew onboard the space shuttle Endeavour in 2000, were only available for the United States. But now NASA is releasing datasets covering the rest of world over the next year. 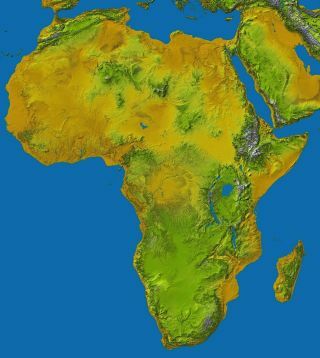 The first topographic maps released cover Africa; the next release will cover Latin America and the Caribbean, NASA officials said. Each pixel in the new datasets covers a 98-foot (30-meter) area of the ground. That's three times more detailed than the 295-foot (90-meter) pixels in the global maps that were initially released to the public in 2003 after SRTM. A comparison of 90-meter- vs. 30-meter-resolution images of eroded volcanic terrain in northeast Tanzania. During its 11-day flight aboard Endeavour, SRTM bounced radar signals off the surface of Earth numerous times from different perspectives, between 56 degrees south and 60 degrees north of the equator. NASA Chief Scientist Ellen Stofan said in a statement that the move to make the space-based data available to the public will "benefit international efforts to better understand natural processes that shape our planet, prepare for and respond to natural hazards and anticipate and prepare for the impacts of global change." Topography can influence the distribution of plants and animals, weather patterns, rainfall patterns and the movement of surface water. NASA officials said these improved maps could help local leaders better understand how flooding, severe storms and sea-level rise will affect their region. The datasets are going online through the U.S. Geological Survey's (USGS) Earth Explorer website. In partnership with the U.S. Agency for International Development and other organizations, NASA is planning training workshops in Africa to show local officials how to advantage of these data resources. NASA retired its shuttle program in 2011 after a three-decade run. Endeavour now lives in Los Angeles, where it is on public display at the California Science Center.